If you’ve ever wondered why you got impacted wisdom teeth and can’t seem to lose weight or keep your back from aching, The Story of the Human Body may be the book for you. Starting with our cousins the Chimpanzees and Gorillas and working its way down the family tree from our earliest ancestors through the agricultural and industrial revolutions to today, Lieberman shows that many of the health issues that plague us today are the result of evolutionary adaptations that are no longer needed in today’s decidedly non-hunter/gatherer society. It makes for fascinating reading, and I especially appreciated the rather subversive support for those of us who find shoes somewhat superfluous. 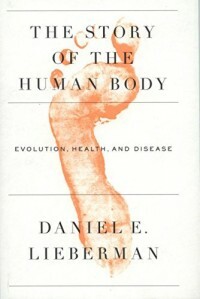 Recommended for anyone with an interest in health, human evolution, or interesting non-fiction.